Judging from the trailers of Super 8, many would think director J.J. Abrams wanted to create E.T. for the new generation. This is somewhat contradictory in itself considering the Super 8 movie is set in the late 70's. Even though it does refer to producer Steven Spielberg a lot, most notably to E.T. : The Extra-Terrestrial and Close Encounters of the Third Kind, it is also not a remake of these. So, in a way, Super 8 is probably more like a recreation of a childhood fantasy. Unlike E.T., the alien creature does not take center stage until late in the movie. And this is for the best, because the alien is the weak part of this movie. Super 8 is at its best while focused on the children and keeping the extra-terrestrial in the background. The children themselves are excellent: in their childish determination to make a zombie flick and in their sense of exploration once things get serious. Performances are good throughout the children cast, with the kid in the main role deserving a special mention, considering this is his first film. Super 8 has a nice 70's/80's feel to it (unlike the recent example of X-Men: First Class, which failed miserably in recreating the 60's). And this comes from both the atmosphere (songs, cars, scenery in general) and the way the movie itself is made. The film is shot with anamorphic lenses which is not a very popular choice as of late (Star Trek, the previous film of J.J. Abrams, was also shot anamorphic, so apparently he does have a thing for this format). The anamorphic artifacts (wide lens flare, vertical smear in out of focus areas, etc.) reinforce the old school feeling. So do the light and the mostly frivolous music as well as the dialogue and situations with a slight touch of non-realism and on the edge of over-the-topness. Pretty much the only weak thing about Super 8 is that the movie loses some steam once the E.T. comes into the foreground. The creature's design does remind of the monster in Cloverfield a bit. And it is simply not very interesting, both visually and thematically. Luckily, this only happens at some time in the last third of the movie. Still, it is somewhat unfortunate, as a good ending would have made a remarkable film out of an already good movie. So, in recap: an easy sci-fi recommendation. 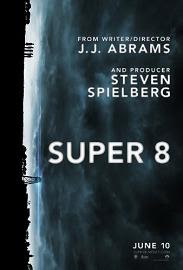 Super 8 might not be as good as its Spielberg inspirations but it does show what a summer blockbuster should be. Now lets see what Cowboys & Aliens has to offer in the extra-terrestrial department. Go through our Review Maze to discover more movie reviews and articles.